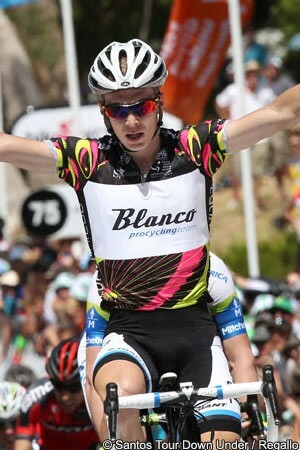 Tom-Jelter Slagter (Blanco Pro Cycling) took his first ever professional victory - and the first for jis new look Dutch team - on the third stage of the Santos Tour Down Under, between Unley and Stirling, as he attacked in the final metres of the uphill finish. The 23-year-old Dutchman, wearing the best young rider’s jersey, managed to hold off a chase from Australian sprinter Matt Goss (Orica-GreenEdge) and World champion Philippe Gilbert (BMC Racing) to win the stage by more than a bike length. Race leader Geraint Thomas (Team Sky) finished in fourth place and, despite Slagter taking a ten second time bonus on the line, held on to the ochre jersey by a slim-five second margin over the Dutchman. "Wat a mooie aankomst [what a beautiful finish]!" Slagter exclaimed after the stage. "I couldn’t expect anything better for my first pro win. "[Team mate] David Tanner put the hammer down with one kilometre to go, that was pretty far but he delivered me in a really good position to open my sprint with 350 metres to go,” he explained. The 139km stage, which consisted of a short hop from Unley to the finish town of Sterling -via the climb to the Eagle on the Hill - followed by six laps of a hilly 21km circuit, was subject to the usual attacks, with a group of around 25 riders breaking clear on the early climb. The first break of the race came after just seven kilometres, after Jack Bobridge (Blanco) had led the peloton over the top of Eagle on the Hill, as the two (unrelated) Australian Clarkes in the race - Simon Clarke (Orica-GreenEdge) and William Clarke (Argos-Shimano) - jumped clear. The two riders worked well together and, by the time they had reached the finish line in Stirling for the first time, were 3’25” ahead of the peloton. Thomas’ Sky team had installed itself on the front of the peloton by now, however, and the gap was not allowed to get any wider. With neither of the leaders any immediate threat to Thomas in the general classification, Team Sky was happy to leave them out in front of the race to eat up the time bonuses at the two intermediate sprints, in Heathfield after 35.2km and 56.6km. Thomas himself took third place in the first sprint, to take the one remaining second and increase his overall lead a little, while Maarten Tjallingii (Blanco) attacked out of the peloton to take the second one to prevent the Welshman from doing so. Gradually the two riders’ lead was eaten away by Team Sky until, with 51km to go, it was just 1’45”. With the leaders so close, however, a group of six riders took the opportunity to escape the peloton and bridge across. Joining the two Clarkes were Simon Clarke’s Orica-GreenEdge teammate Daryl Impey, Steve Morabito (BMC Racing), Andrey Amador (Movistar), Boy van Poppel (Vacansoleil-DCM), Thierry Hupond (Argos-Shimano) and Brian Vandborg (Cannondale). It was at this point that there was a crash in the peloton, which brought down Timmy Duggan (Saxo-Tinkoff), and the US champion left the race with what was later confirmed as a fractured collarbone. The peloton was not keen to allow this new expanded breakaway take much time, and as it entered the final circuit it had no more than 20 seconds. Further attacks began, however, with Damien Howson (UniSA) and Christopher Juul-Jensen (Saxo-Tinkoff) both attacking the peloton; Vandborg was dropped from the breakaway group up ahead. Inside the final 15km Morabito and Amador tried to get away from the lead group but, as they were pulled back, William Clarke and van Poppel were both dropped. The small gap to the peloton was continuing to shrink, however, and with little more than five kilometres to go the race was back together. Almost immediately the break was caught Tiago Machado (RadioShack-Leopard) jumped clear, but the Portuguese rider was only able to get a few seconds clear before being pulled back. Cameron Wurf (Cannondale) then launched a move of his own, and led the race into the final kilometre, but the peloton was lining itself up for the uphill sprint and the Tasmanian was caught as Tanner began to lead Slagter into the finishing straight. Slagter then made his move and managed to hold off Goss and Gilbert as he took his first ever professional victory.